In the next block, deeply recessed from the street is a barely visible Wright structure, which was built or remodeled by Wright about 1896 as the "Roberts Stable". 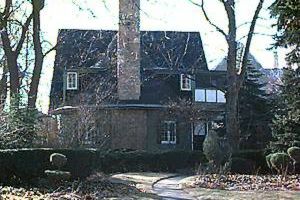 This structure was moved in 1929 to its present location beside the main house by Roberts' son-in-law, the noted architect Charles E. White Jr., who remodeled it into a residence. The Roberts Stable House is best viewed from the street in winter or early spring, as the lush trees and bushes obscure the house. Take a look in summer.